The competition has two stages: Qualification Stage (Online) and The Final Stage ( Physical). Anyone who passes the qualification stage individually can participate without any adherence to the age or the nationality or education. The minimum number of players/team is two and the maximum number is four. 50 % of the team must be undergraduates. 50 % of the team must be holding the nationality of Egypt i.e: If a team consists of two, one of them must be Egyptian. 1- Any attack against the site or the hosted servers will be observed and teams might be banned from participating in the CTF. 2- Running Automation tools are not allowed and won't help you complete the challenge. 3- Sharing flags between different teams is prohibited. 4- Brute Force attacks on the challenges submission portal or challenges links are not allowed. 5- Any trials for interrupting the CTF, or any unethical behavior, Organizers has the permission to disqualify teams. 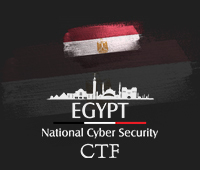 The Top three Teams of Egypt National Cyber Security Competition CTF will participate to represent Egypt at Arab Regional Cyber Security Competition CTF that will be held in September 2019 in Cairo, Egypt. The winning team of Arab Regional Cyber Security Competition CTF will represent the whole Arab countries in TrendMicro Competition 2019 at Tokyo in November 2019.